It was Emory at Oxford but with a twist. It was Oxford in England, and we were at University College, in the center of that great, seven-hundred-year-old place of learning. Our hosts were Professor of English Ron Schuchard and other Emory faculty who were in Oxford for the six-week British Studies summer abroad program. The event was a garden party and a chance for the forty-five Emory students who were in Oxford for the summer to meet our alumni in the United Kingdom. The day was brilliant, as the British say. Eighty degrees with no threat of rain. Our Emory students came dressed "respectfully," as requested by their faculty. Twenty-six alumni and friends, out of a total of eighty-seven in all of the United Kingdom, joined us. Dan Soffin '80C, our stalwart in London for a number of years, made all the arrangements, and John Allo '31Ox, our most senior alumnus in Britain, made the trip out from London, thereby helping us feel the day was complete. It was a wonderful experience, and one I hope we will replicate each summer as a new group of Emory students arrives. But we didn't travel all the way to England just for a garden party. In keeping with Emory's goal to increase our institutional reach in the international arena, we-Nicole Kruse from Emory's Office of Foundation and International Relations and myself-made many visits to charitable foundations and organizations in London that might share an interest in teaching or research opportunities with Emory. We also spoke with many of our alumni highly placed in business, law, and academe who are anxious to help Emory make connections to benefit our students, faculty, and other alumni. I was particularly gratified that so many of our calls to alumni resulted in a pledge to help us with career opportunities abroad for students and alumni. We will follow up on those offers this fall with the arrival of our new Alumni Career Network director. It was a good trip, one I believe will benefit Emory in the long run. The response from our alumni was incredibly supportive. They unanimously endorsed our push toward greater internationalization and urged Emory to make the most of its unique opportunities in the world community. Please tell me what you think. My phone number is 404-727-6400, and my e-mail address is rcarpen@emory.edu. In 1996, Beth Gustafson '94T enrolled in the week-long Alumni University seeking a way to stay in touch with Emory as a new alumna. This summer, Gustafson, who recently completed her first year as pastor of a small Methodist church in Aransis Pass, Texas, returned for a different reason. "I was looking for a break from my work as a minister," she says. "I really needed to step back and feed my spirit." An Alumni University course in T'ai Chi Ch'uan offered Gustafson the spiritual nourishment she needed. She spent an hour and a half every morning learning the slow, deliberate movements and mental discipline of the ancient Chinese martial art taught by JoAn Johnstone Chace, wife of University President William M. Chace and co-author of a book on T'ai Chi. "It's a way to spiritually, mentally, and physically find a focus and remain focused," says Gustafson. "It helps me connect my mind with my body." Gustafson was one of forty-one out of 172 in attendance who paid a return visit to Emory for the fourth Alumni University, June 22­27. The annual summer program of morning classes, afternoon plenary sessions, and evening activities is offered to alumni and friends and family of alumni seeking "a vacation for the mind." Since its first year in 1994, six people have attended every session, and another thirty-five have attended at least twice. While most attendees registered for the full week, twenty-two others came exclusively for an abbreviated version of the program. Introduced this year, the Alumni University Seminar Weekend was a two-day option at the beginning of the week that featured an in-depth look at U.S. policy toward Israel. With access to the Association for Israel Studies meeting being held on campus simultaneously, weekend seminar registrants attended lectures by experts from the United States and abroad, including a keynote address by Naomi Chazan, a member of the Israeli parliament. Participants who stayed for the full week chose two courses out of a slate of eighteen. Among the most popular were a workshop led by anthropology professor Peggy Barlett, titled Adult Behavior: Reflecting on Life Transitions; Brain Repair with graduate school dean and Professor of Neurology and Psychobiology Donald Stein; and Stories and the Moral Life with Secretary of the University Gary Hauk '91PhD. The afternoon plenary sessions centered on "Global Challenges and American Interests: What's Driving U.S. Foreign Policy?" The roundtable discussions featured faculty with expertise in different parts of the world. For example, law professor Abdullahi An-Na'im, who was exiled from Sudan for his moderate views on Islamic law and theology, spoke on "Cultural Transformation and Democratization in Africa," and Professor of Political Science Robert Pastor, a Carter Center Fellow in Latin America and the Caribbean, discussed "Mediating Democracy in the World." Evening activities included the perennial jazz coffeehouse with Associate Professor of Music Dwight Andrews, a literary salon with Atlanta poet Capers Limehouse and several Emory and Oxford faculty, and a group discussion on "The Challenge of Creating a Sustainable Future" with Barlett and Sue Wootton, regional director for The Natural Step/US, an organization devoted to teaching business, government, academic, and community leaders about principles of sustainable technology and environmental responsibility. Such experiences will continue to draw Gustafson to campus in summers to come. "Emory was a good experience for me, and this time allows alumni to appreciate all the University still offers us," she says. "I enjoy the camaraderie of other alumni and just taking time out for myself and my soul."--A.O.A. Immediately on arriving at Emory University, located on a 235-acre wooded campus just outside small-town Decatur, the beginning freshman drove his Ford roadster around the campus, quite uncertain where to turn first. He had arrived much too early, so early that the dormitories were not even open yet." So begins Vaughn Davis Bornet's recollection of his first year as an Emory College student in 1935, recorded in his recently published illustrated memoir, An Independent Scholar in Twentieth Century America. In spite of his early arrival, Bornet quickly found an open door on campus. Mrs. "Ducky" Drake, housemother for the Sigma Chi fraternity, invited the bewildered young man to stay in the house for a few days. Before long, Bornet was a Sigma Chi brother. In addition to the chapter on his Emory years, Bornet's memoir offers a lively personal chronicle of his early youth in Pennsylvania and Florida, his service in the Navy during World War II, and his career as a writer and researcher. A professor emeritus of history and social science at Southern Oregon State College, Bornet is the author of studies on the presidencies of Herbert Hoover and Lyndon Johnson and is a scholar on U.S. welfare systems.-A.O.A. Hunter Champion '93C, a fourth-year medical student at Tulane University, was recently elected vice chair of the Medical Student Section of the American Medical Association. During his year-long term, he will serve as an ambassador to other medical student organizations in the United States and Europe. Champion is also chair of the Consortium of Medical Student Organizations, and he recently received the AMA/Glaxo Wellcome Achievement Award for leadership in his community and in organized medicine. When screenwriter Norman Lear and his wife went in search of a quilt to brighten a room in their Vermont vacation home, what they found was no ordinary patchwork. Working with Stacy Shaw '82B, owner of The Quilt Finder, the Lears commissioned a hand-sewn "quiltrait" of their home and its environs. The quilt was so detailed it even featured a reflection of the house in the lake it faces. Since Shaw and a partner began their custom quilt enterprise in Pasadena seven years ago, she has helped hundreds of clients conceive and design quilts ranging from traditional heirloom patterns to ultracontemporary wall hangings. Working with some seventy-five quilt makers across the United States, she conducts most of her business over the phone and through the mail. "We give customers a blank canvas, and they can paint on it whatever they like," says Shaw, whose clients have spent hoursmin conversation with her over the company's toll-free phone line. They often send her letters containing stories of a childhood home, photographs of family pets, and rough sketches. "Our customers' satisfaction depends on our ability to 'listen' a quilt to life." The finished products reflect each customer's unique vision and experience. One woman, whose adult daughter had died of cancer, sent Shaw three boxes of her child's clothing with a note attached to each item to explain its significance. Shaw found a quilter who stitched scraps of the clothes together in a Victorian crazy quilt. "It was a way of having her daughter back," Shaw says. Another customer commissioned a quilt to give her son, who was writing a book about rhinoceroses. "We're doing the quilt as the continent of Africa, with a rhinoceros and several other African animals, plus the Serengeti and Mount Kilimanjaro," Shaw says. Quilters represented by Shaw also have depicted a restored 1960 Lincoln Continental, a beloved pet iguana, the Chicago Cubs insignia, favorite flowers, mailboxes, porch swings, tractors, and even the Washington, D.C., Temple of The Church of Jesus Christ of Latter-day Saints. "We haven't been stumped yet," Shaw says with a laugh. "We feel like we're in the dream business. If they can dream it, we can do it." Shaw's love for quilting was inspired when she worked as a marketing director for a childcare benefits consulting firm. 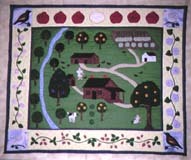 During business trips, she would often drive past rural roadside stands where racks of hand-sewn quilts hung for sale. Inevitably, she would pull over to admire their carefully crafted beauty. When a family emergency forced her to leave her job, she and her partner decided to launch The Quilt Finder, proposing the idea to quilters she had met on the road. "We thought this was a way to support a very important cottage industry and to continue the preservation of a truly American art," she says. "It also makes a whole country's worth of quilted art available to people." Quilt Finder quilts range from $500 for a relatively simple three-by-four-foot wall hanging to $4,000 for an heirloom quality, queen-sized quilt. Depending on the size, complexity, and time of year, a project can take from three to twelve months to complete.--A.O.A. If you would like to phone in this information, call (404) 727-6400 or (404) 727-4249. You may also fax to (404) 727-4876 or e-mail at eurec@emory.edu. He never meant to be a TV star. But his unaffected Tennessee charm makes his television and radio commercials, now aired in six Southeastern states, memorable and persuasive. "People say, 'I know you-you're the ice cream guy!' " says C. Scott (Scottie) Mayfield Jr. '86EMBA. "I've even been asked to give autographs." He laughs, clearly delighted. "The funny thing is, it doesn't bother me a bit to do them. I don't get nervous at all." President of Mayfield Dairy Farms Inc. of Athens, Tennessee, Scottie Mayfield has been promoting his family's dairy products for most of his life. He began working at the dairy (on land farmed by Mayfields since the 1820s) and then in the plant as a young teen, taking a full-time job at Mayfield after earning his bachelor of science degree in management from the Georgia Institute of Technology in 1973. He worked his way up from construction coordinator to sales representative to sales manager, becoming vice president of marketing in 1984. By that time, the fourth-generation Mayfield dairyman was ready to expand his personal horizons, as well as his company's marketing strategies. Commuting from Tennessee on weekends, he enrolled in the Executive MBA program at Emory. "We doubled our business when we moved into Atlanta with ice cream in 1977," he recalls. "A big question for us was whether we should try to compete in the Atlanta market with milk." At Emory, the Mayfield marketing chief found a wealth of advice from textbooks and case studies, visiting professionals, and peers-and from faculty such as Brown Whittington, now emeritus professor of business administration, who taught an innovative "living cases" course in distribution. When the professor needed a small-business example for a class a few years later, Mayfield Dairies volunteered. Working with Mayfield and other company executives, a team of MBA students examined such distribution challenges as personnel, pricing, capital investment, routes, trucks, and facilities should the company decide to expand milk service to Atlanta. "Being a privately owned company," Mayfield cautioned in his initial proposal to the class, "we cannot afford to make many mistakes." The students' evaluation confirmed what Mayfield already suspected: launching milk in Atlanta was the next logical step, but supporting such a move would be very expensive. "For two guys in their late sixties who had mortgaged their farm years ago and paid down the debt, the idea of building a second plant to serve Atlanta just wasn't what they wanted," says Mayfield of his father and uncle, who then led the company. "It took a lot of courage for Scottie to sign his company up as a 'living case' and let the students evaluate the situation," says Whittington. Of particular concern for family-owned businesses, he observes, is the long-term effect of debt and expansion on family succession.